Timeline leads to V 1.0 ? stanlea wrote: Timeline leads to V 1.0 ? And don't forget the secret git-branch you told me about: Qtractor as a Linux kernel module for increased performance! Audio output monitoring on midi tracks! 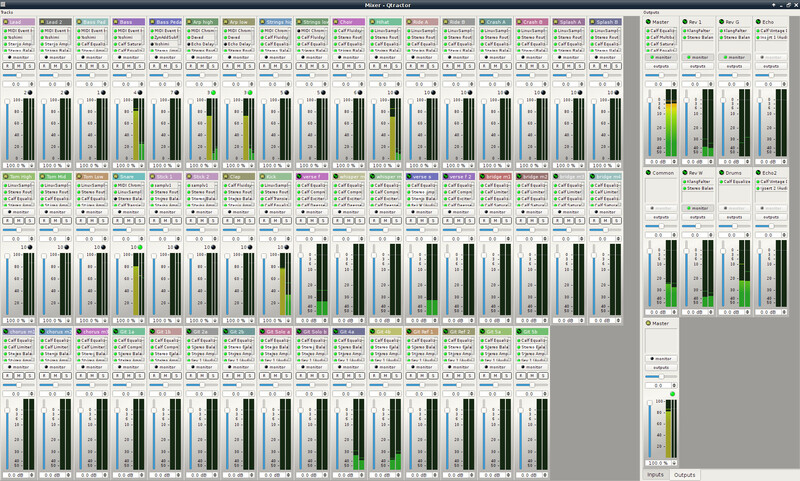 thebutant wrote: Audio output monitoring on midi tracks! I like that feature, too. Looks as if Rui had to make new screenshots. bluebell wrote: Looks as if Rui had to make new screenshots. nope. the screenshots are still the same as if those new options were never activated though. take note that audio output meters are only meaningful for MIDI tracks (or buses) that have at least one MIDI instrument plugin inserted; on all other cases the monitoring and meters are a pure waste of cpu and graphic resources and adds nothing to "eye candy" but a couple of dead-black bars anyway. No, I didn't know that. Thanks. Cool feature!